Issue #7 starts with the Daily Star staffer, Curly, showing everyone how meek Clark is by making fun of him. When realizing that Kent is too much fun to mess with, Curly continues to pester Clark. Lois saves Clark by saying that the boss wants to see him in the office. Clark is told to see the Jordan Circus this afternoon when they open; to interview the owner. As Clark arrives he hears angered voices in the owner's wagon. "Sounds like an argument, I'd better wait before entering." Within the Wagon: "You'll take my offer - or else!" "Take you in as a partner? The blazes I would!" A man named Derek Niles states that the owner doesn't have the money to pay his notes so he has no choice but to take him in as a partner. The owner is not happy with the proposal. As the owner is sobbing that he will lose the Circus because he cannot raise the money in time, Clark walks in. "You can tell your readers we're here with the greatest circus-show on earth - clowns, animals, acrobats - a fine production, typical of the successes the name of Jordan has been associated with for years! You can tell them too that we've hired several hundred extra attendants to help handle the huge audience we expect to have attended�- got that?" Clark says it will be the next edition and wishes him luck. Clark decides that the owner needs a break and that is just what he's going to give him. That afternoon the circus opens, but plays to an empty gallery. Clark thinks to himself while watching the show, "The show is good - but it lacks "flash". - that's where Superman takes a hand!" That evening Clark dons the Superman garments and heads to the Circus owner's wagon. He tells the owner to turn around and not be alarmed. Mistaking him as a burglar he tells him that he's come to the wrong place because he has no money and suddenly pulls a gun on him which Superman snatches up and destroys. The owner is completely amazed and asks what Superman wants. He says he wants a job as a strong man. He shows him that he is better than his current strong man. Realizing he is Superman, the owner becomes excited with joy! The next day, full page ads appear in all the local newspapers for SUPERMAN to be the star of the Jordan Circus! Meanwhile Derek Niles sees the ad and sets out to see what all the fuss is about! Lois Lane also sees the ad and decides to see Superman in person. A mob of curiosity drives crowds into the circus. The Circus begins, but the crowd screams for Superman! Superman emerges and impresses the crowd. Derek Niles leaves the circus to think about how to keep the Circus owner from getting enough money to pay his bill. He decides that "accidents" would ruin the circus. Lois tries to get in to see Superman after the show, but isn't permitted so she sneaks in the tent. Upon entering Lois spots a prowler (Niles' hireling)! He snatches up Lois, bounds her hands and feet and brings her to Niles who is not happy about this new situation. Niles orders his henchmen to call him when the "accidents" start. Fist a Lion is let loose which Superman quickly puts back in its cage. Next a trapeze performer falls from a tampered bar, but Superman catches her. Superman also keeps the entire tent from collapsing and starts to wonder what is going on. A guard dog starts chasing Niles' henchmen so Superman grabs him up for questioning. When he gets no answers Superman decides to toss "Trigger" high into the air before offering him up a second chance to come forward before he doesn't catch him the next time. Trigger then tells him that Niles did it and has a girl reporter in his office. After saving Lois, Clark Kent returns to the office only to be messed with by "Curly" again. Clark thinks to himself that Curly needs to be taught a lesson and that he was going to get one! A short time later as Curly passes a door, a hand reaches out and seizes his clothes right off. "Why Curly! - You're undressed! - TCH! TCH!" Story - 4: The story was very good. Superman was really out to help the oppressed back in the day. Now he just saves the universe in every story, if not, just the whole Earth. I like these stories where he is helping just one or maybe a few individuals in a big way. I did not like how he basically made fun of the Strong Man that the circus did have, but I guess that really didn't have much bearing on the story. All-in-all, a well written story. Art - 4: The first thing I noticed here: Yellow boots. Not on the cover however, only in the comic. This was weird, I thought it was a screw up, but it continued throughout every panel that Superman was in. It is weird looking and I can see why they pushed back to red in the next issue. This Superman is beginning to really take shape into that classic Superman we all know and love; square jawed and squinty eyed. 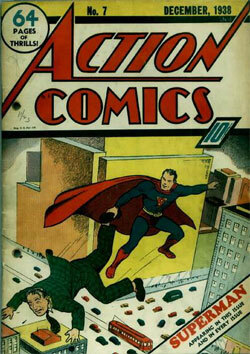 Cover Art - 4: We haven't seen a Superman cover for Action Comics since issue #1. This is the second Superman cover of all time. It has a lot of action and emotion. I also like the confidence on Superman's face, but his pose is a bit awkward. It looks as though he is standing on the air without moving, but the motion lines clearly indicate that he is flying through the air, he just doesn't appear this way.